First off, my heart and prayers go out to anyone affected by the recent storms in SW Missouri, Illinois and some of the southern states. May God bless you like he blessed us almost a year ago! It's been a busy week. Our Math focus this week was on 3D shapes. As I explained it to my kiddos...3D means coming at you, hence the title of this post. Here are some of our activities. 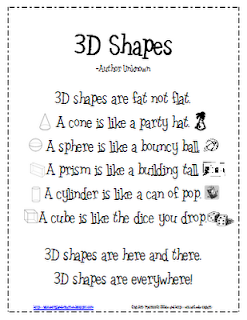 Click here to pick up this freebie 3D shape poem by Marlana at Lil'Country Kindergarten! Poetry is a great way to introduce a topic..short, sweet and a CCSS! To get us started, we passed around the shapes and made a 3D shape version of the chart I found at Kindergarten Kindergarten. You can grab my copy of the chart here. We are lucky to have a poster marker so I blew it up! We also read the story Shapes That Roll and worked cooperatively to see if our 3D shapes could roll, slide or be stacked. My response sheet is yours if you want it! This is one of my little friends. And the rest of our week? Well, it got very Seussy in here! Where would you eat Green Eggs and Ham? You have a what? Where? based on There's a Wocket in My Pocket! This was one of my "one activity that morphs in your head while you're reading the book" activities. Does this happen to anyone else? Thank goodness our Early Lit teacher, Mrs. Dobbs, stuck with me!! The Cat's New Stuff after reading The Cat in the Hat. We decided he needed something else! Our writing on our bulletin board and our Cat glyphs from Rachelle at Life Is Sweet...In Kindergarten! And, to end our week, guest readers! I know she will be tickled pink to see this post, so here are some A-DOR-A-BLE!!! Thing 1 and Thing 2's that our first grade teacher, Mrs. Bashor, had her class make to accompany their writing. Gotta love Pinterest! Wonder why I am so worn out?? Have a great weekend! I have just given your blog an award. Come check out my blog for the details.